Seasons change and so do safety hazards. Help protect your family by staying one step ahead. Take time to review your Home Safety Plan and involve your kids in learning all year round. As the weather heats up, families will seek refuge in the cool waters of their neighborhood or backyard pools. Although there’s nothing like a quick dip on a hot summer’s day, pool season doesn’t come without potential risks. In fact, approximately 4,200 people go to the emergency room every year due to pool or spa-related injuries. This summer, UL, a leading product safety testing organization, is providing useful tips to help you and your “little minnows” stay safe. Know your swimming limits and stay within them. Don’t try to keep up with a stronger skilled swimmer or encourage others to keep up with you. Keep an eye on weaker swimmers—if they appear tired, encourage them to get out of the water and rest. Watch out for the “dangerous too’s”—too tired, too cold, too much sun, too much strenuous activity. Get out of the water immediately if any of these situations occur. Stay off the main drain. The suction from the pump could trap you underwater. Use common sense regarding food and beverages while swimming. Do not chew gum or eat while you swim; you could easily choke. Never drink alcohol and swim. Use common sense about swimming after eating. If you have had a large meal, it is wise to let digestion get started before doing strenuous activity such as swimming. Obey “No Diving” signs. A general rule is to enter feet first into water than head-first. Never dive into an aboveground pool. They are too shallow. Make sure the pool cover is completely lifted off the pool. Never walk on the pool cover. Watch the weather: Know local weather conditions and prepare for electrical storms. Because water conducts electricity, stop swimming as soon as you see or hear a storm. Keep a phone poolside. Program the phone with emergency phone numbers and/or post emergency phone numbers in your pool area. Learn cardiopulmonary resuscitation (CPR) and basic first aid. Post CPR instructions in your pool area. ALWAYS supervise children when they are in or around your pool or any water environment (stream, bath tub, toilet, bucket of water), no matter what skills your child has acquired and no matter how shallow the water. 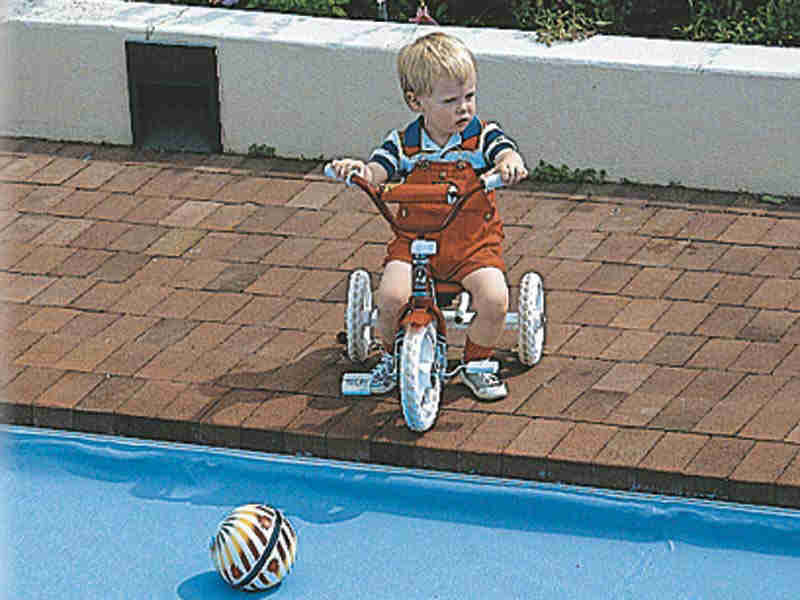 Install physical barriers around your pool and spa to prevent access by young children. Fences should be at least four feet high with self-closing, self-latching gates, which are kept in good working order. Don’t leave any furniture near the fence so that a child could climb over into the pool area. If your house forms one side of the barrier to the pool, then doors leading from the house to the pool should be equipped with alarms that sound when the doors are unexpectedly opened. For additional protection, use a power safety cover (a motor-powered barrier placed over the water area). For aboveground pools, steps and ladders to the pool should be secured or removed when the pool is not in use. Keep children off the main drain. The suction from the pump could trap them underwater. Be sure to have a main drain cover. Enroll your children in a water safety course and/or swimming classes. Never use flotation devices or inflatable toys to replace parental supervision. Do not use air-filled swimming aids as a substitute for approved life vests. Do not allow children to eat or chew gum while in the water to prevent choking. Parents and anyone supervising children should know cardiopulmonary resuscitation (CPR) and basic first aid. Post CPR instructions in your pool area. Don’t assume young children will use good judgment and caution around the water. Children must be constantly reminded to walk slowly in the pool area and only to enter the water with you. After you are done swimming, secure the pool so children can’t enter. One of the most important parts of the circulating system is the skimmer, and perhaps the most important part of the skimmer is the float valve. The purpose of the float valve is to protect the pump and control the circulation of the water. The float valve, a round plastic part that resembles a flying saucer, should be seated on the ledge at the bottom of the skimmer below the basket. Inside the float valve there should be a float that drops down when not submerged. This protects the filter pump should the pool water level drop below the skimmer throat.